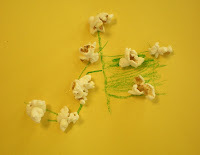 One of our Pre-K classes made these delicious flower creations. They look really easy. I wasn't there, but I'm sure some bellies got full along the way. Pop the popcorn. 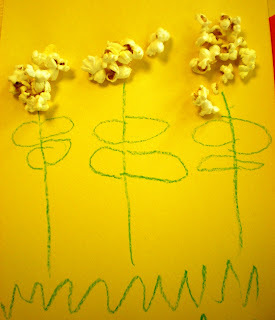 Let the children draw stems on the paper. 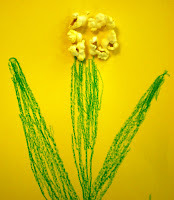 Add lots of glue where a flower will go, and add the popcorn. The look as good as they smell. 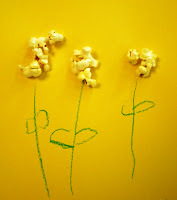 my son just saw the popcorn pics and said, "thats cool!" we will do this activity soon! I love this!!! I'm a huge popcorn fan--- I even dressed my son up as a box of popcorn for Halloween--- we have to try this. THANKS for sharing!!!!! !